Thanksgiving is supposed to wear us out. And even if a turkey-tryptophan-sleep connection isn’t rock-solid as we were once led to believe, every Thanksgiving still brings the draining combination of travel, preparation, and digestion. However, if Black Friday proves anything, it’s that we’re never too tired to shop. These days, over a hundred million of us brave the Black Friday retail scene in person. Even if pie-induced comas prevent us from going to the store, we still find a way to shop: online shopping on Thanksgiving and Black Friday ballooned to $7.9 billion in 2017. Even more people are able to fight through their food-comas to shop online. Thanksgiving and Black Friday online shopping ballooned to $7.9 billion in 2017 – a 17.9% year-over-year increase! So what does this mean for ecommerce retailers? How to prepare for an onslaught of shoppers headed your way. Advertising gets very expensive in Q4 and so to have a successful marketing strategy, you should start filling the top of the funnel at the beginning of July so you can focus on converting existing on Black Friday. – Erik Huberman, Founder and CEO, Hawke Media. This year, Black Friday (November 29, 2019) will kick off a shopping season that comprises 30% of all sales for the year. In some industries like jewelry, the post-Black Friday madness will account for as much as 40% of revenue. Serious enough that you’re more likely to die during the Black Friday hysteria than in a shark attack. Almost one-quarter of all Black Friday retail shoppers are willing to camp out in anticipation of Black Friday. The few short days from Thanksgiving through Cyber Monday draw about a fifth of holiday sales all season long. The only year-to-year decrease in Black Friday shopping throughout the past decade came during the Great Recession in 2008. Though the Dow Jones Industrial Average had dropped by thousands of points by the holidays, Black Friday sales only dipped by 4.6% from year-to-year. Any business that wants to reach customers throughout the year has to view Black Friday and the subsequent holiday shopping season as the definitive time to push. Just check out these campaigns focused on Black Friday. It’s also the time for consumers to think about grabbing sales while they last. Yes, customers are looking for great deals and brands can take the opportunity to grow their customer base by providing attractive offers. Offer a legitimately unmissable deal at a price point that you don’t offer during any other holiday or sales event of the year. Since Black Friday is such a high-spend shopping day, you need to be competitive to stand out. Since people are already in the mindset to entertain impulse buys, your deal should take advantage of a human’s desire to justify a purchase. Buying from you will feel like a no-brainer. – Maddy Osman, SEO Content Strategist, The Blogsmith. According to AMA.org and 2016 data, customers can expect substantial discounts on the following categories throughout Black Friday. However, some items are so popular, you might expect them to encounter stock issues come Thanksgiving, especially in the realm of bedroom furnishings and computer sales. Buyers remorse is also a real affliction during this time. Up to 40% or more of Black Friday shoppers end up buying something they regret. Providing great customer service and easy return options can help earn a customers trust for future purchases. Use a landing page to narrow focus on a few select Black Friday products. Use a banner or a counter to make it clear that inventory is dropping, and they need to buy now to secure the deal. – Nick Raushenbush, Cofounder, Shogun Landing Page Builder. Where and when did all this frenzied shopping begin, anyway? The popular myth is that the phrase “Black Friday” described how retail stores spent most of the year “in the red” on their balance sheets. The holiday shopping season, beginning on the Friday after Thanksgiving, put them back into the black. Hence, Black Friday. As it turns out, that popular story is designed to cast the term “Black Friday” in a positive light. According to History.com, Philadelphia police started using the term “Black Friday” to describe the post-Thanksgiving chaos that came from a rush of shoppers and tourists. It wasn’t only that these tourists were in town for Thanksgiving – they were also there to watch the traditional Army-Navy football game. With Black Friday sandwiched in between a national holiday on Thursday and the popular college football game on Saturday, it became a favorite day for tourists to shop–often to the point of excess and even looting. Because shopping back then could get just as intense as it is today, the term “Black Friday” proved hard to shake. Even as local Philadelphia businesses tried to change it to “Big Friday,” the gloomier term held sway. By 2003, Black Friday was the busiest shopping day of the year in the United States. It has yet to give up that status. As in the United States, the UK term “Black Friday” came from local police. The difference here: “Black Friday” traditionally referred to the Friday before Christmas. Both police and hospitals noticed a spike in demand for emergency services thanks to partiers enjoying the last weekend before the holiday. Oftentimes, that meant the first day away from work to begin a long holiday weekend. But the UK is also familiar with the “Black Friday” event as known in the United States, with the Financial Times calling the season “the most important” in Britain’s retail sector. The final quarter of the year makes up more than its share of revenue at 30%. Australia and New Zealand are not immune to the online shopping opportunities centered in the U.S.
As recently as 2015, major New Zealand retailers like The Warehouse started noting the retail holiday’s importance by offering their own deals. Apple expanded its own offerings to Australia in 2013 under the Black Friday promotion, suggesting that Black Friday may have a bigger future as an overseas holiday than the Thanksgiving holiday, which is traditionally limited to North America. Given the increasing importance of Black Friday as the launching pad for the year-defining holiday season, it’s only prudent for any business to have their site prepared for the inevitable Black Friday rush. Why? Because your customers will. According to eMarketer, many customers begin their holiday shopping (or researching) as early as October. The time to entice with coupon codes and special offers isn’t Thanksgiving – it’s well in advance of the holiday weekend. 2. Check your site speed. Ever hear the phrase “speed kills”? BigCommerce has introduced Akamai to help optimize images across your site and keep it fast. 3. Keep your site up. Downtime is bad for business, bad for the customer – it’s bad for everybody. Test the server load capacity of your store with tools like LoadImpact.com or Blitz.io. BigCommerce does a great job with a 99.99% uptime. Think NASA-style redundancies: Have backups for everything, from site code to product images. Black Friday only comes once a year, which is why it doesn’t hurt to treat it as a rocket launch of sorts. If all goes well, you’ll never have to use these redundancies–but it never hurts to have them on standby. Black Friday Pro Tip: Communicate – Often! Communicate with your customers and people that know you, as often as you can and as many ways as you can. Send out multiple emails in a single day, send a messenger blast, send a SMS message if you can, retarget your email list, engagement audiences, visitors audiences, and purchasers on as many platform as you can. – Eric Carlson, Co-Founder, 10xFactory. Black Friday doesn’t have to be a scary, monolithic make-or-break experience. With your site ready to handle the Black Friday rush, it’s time to take advantage of the burst of online activity. 1. Get ahead of the curve. Remember how eMarketer reports that the holiday shopping season starts in October? Use holiday-themed incentives in advance of the holiday, promising big-time rewards and discounts on the big day. Promote your site’s newsletter to drive subscription so you can send out an effective email blast when the big holiday comes. 2. Put your retargeting strategies into place. As shop-crazy as many customers are on Black Friday, not everyone is going to buy something that very day. Keep some retargeting strategies in place so you can follow up with people who never checked out online. If you use BigCommerce there are even specific Apps you can employ for just this purpose. Even the most nascent digital marketer knows that remarketing is one of the first boxes you check for any ecommerce company’s customer acquisition strategy. Holidays give you an opportunity to do more swaggy remarketing. Not only that, but every dollar spent on ads is an investment that should pay off for the holiday. -Kevin Simonson, CEO/Co-Founder, Metric Digital. 3. Start pitching to gift guides. One reason to get ahead of the curve is it lets you position your products well in advance. The holiday gift guides of popular bloggers is a great place to start. PR Couture recommends not spreading yourself too thin, but instead focusing on your most popular items. You’ll also want to research popular blogs to get a sense of which products will make the most sense for pitching. 4. Use the time-window of the holiday season to make the most of countdowns. Temporary sales and shopping codes are great ways to add “scarcity” to your sales pitch. Use a tool like Beeketing to create a countdown that reminds people that your sales aren’t going to last. Beeketing offers the best-in-class marketing apps created to help BigCommerce entrepreneurs scale revenue up without hassles. 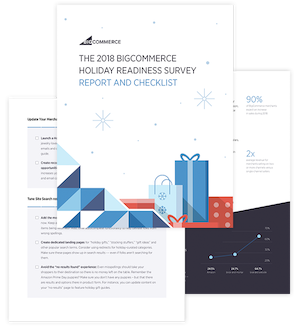 $56.4M+ extra sales generated for BigCommerce merchants in past 2 years. 23.8% average conversion rate that is 2.5 times higher than the average. 5,800+ BigCommerce entrepreneurs are using Beeketing to grow. Find the right apps for your BigCommerce store no matter your business size. The holiday season gives you a chance to monitor your site’s performance and gather new insights. Use Google Analytics and heatmaps from sites like Hotjar to discover what’s right (and wrong) with your site. Your holiday traffic might behave differently than your normal traffic, so these insights can help you tweak your site so it’ll perform better next year. 6. Prepare an email strategy in advance. Timing emails for Black Friday requires some prep work. And since Custora reports that over 25% of Black Friday sales start with holiday email marketing, it pays to have your blast written well in advance. “Because emails are so critical and deliver huge ROI, prepare your emails well in advance. Have the copy ready, the images ready, and the email prepped to go. 7. Create a Black Friday-specific landing page. You can create a Black Friday landing page to drive email signups in advance of the holiday, then send out your email on Thanksgiving with links to your top-selling products, services, and specials. Are you personalizing the shopping experience? Sending tailored, personalized marketing messages to the right people at the right time will increase your odds of conversions and sales. “For Black Friday, eCommerce merchants should send hyper-personalized emails before and during their sales. Start by segmenting your subscribers into distinct groups based on their geographical locations, previous purchasing history, and overall email engagement. 9. Think creatively about email subject lines. “A traditional discount-only approach is likely to be lost in many inboxes among the sea of other vanilla offers. Instead, try to come up with a creative sales promotion that can capture your customers’ attention via a compelling email subject line. 10. Go beyond Black Friday. “Instead of trying to capture a share of sales on just Black Friday, create and advertise promotions for each major associated shopping day. Shoppers on Amazon are looking for deals, discounts, and coupons on Black Friday and Cyber Monday. Give your customers great value on your best products and treat these selling events as marketing opportunities to accelerate sales volume more than profit drivers. – Pat Petriello, Head of Marketplace Strategy, CPC Strategy. Black Friday is everything but an official holiday for companies across the world. But it’s not driven solely by retail outlets and online shopping. After all, Black Friday isn’t all about consumerism and mass avarice. Many of the items purchased during Black Friday sales are for others. And with almost one-fifth of people shopping just to spend some more time with family and friends, it can’t all be bad. It’s not bad for your business, either.